Advantages: Easy to read style, well researched, superb colour artwork, 120 well-chosen photos. For the battles of Verdun and the Somme, various escadrilles de chasse were combined to operate together. The success of this arrangement led to the creation of groups on a more permanent basis. On the 16 October 1916, Group de Combat 12 was formed and began operational duties on 1 November of the same year. It was under the command of Félix Brocard and initially comprised of escadrilles N3, N26, N73 and N103. At its heart was escadrille N3 and it was only fitting that GC12 would adopt variations of N3’s stork insignia. The inspiration of this design coming from the storks that made a home on top of the chimneys of Alsace-Lorraine. Jon Guttman’s latest 128-page book in the “Aviation Elite Units” series tells the story of GC12 from its inception to the last days of World War 1. The reader is first given grounding as to the pilots and escadrilles that first made up the group. From there the author takes us through the exploits of the many flyers that saw service in this famous unit, including some enlightening passages on their Nieuport, SPAD VII, SPAD XII and ultimately SPAD XIII aircraft. The text is littered with first-hand accounts from the pilots involved and these are cleverly woven into the narrative. As a result, much insight is gained from the pilots’ perspective and Guttman’s energetic writing style means this volume is more than simply a “who shot whom”. And yes…the American volunteers also get a mention. To compliment the text, there are more than 120 well-chosen photographs. These providing a good representation of man and machine. Harry Dempsey does his usual admirable job of providing the colour artwork for the various aircraft involved. There are colour profiles for 40 machines, 8 of which have supplementary plan views. Inevitably, some have been seen before in other Osprey titles, but this has been kept to a minimum. 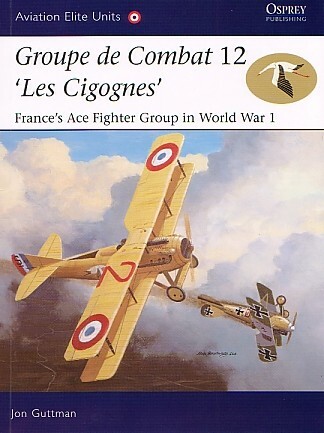 With more than 280 victories attributed it, GC12 was the premier fighting group of France. The unit had amongst its members such aces as Fonck, Guynemer, Deullin, and Baylies. It is therefore fitting that a book of this type should be attributed to “Les Cigognes”. Jon Guttman certainly does justice to this latest title by providing an informative and entertaining read. Thanks to Osprey Publishing for the review sample.